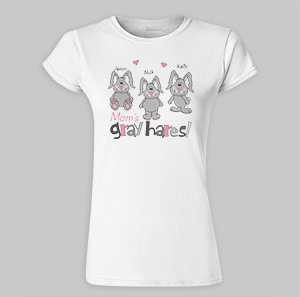 This extremely comfortable Personalized Gray Hares Women's Fitted T-shirt for her is sure to be a favorite for relaxing at home to traveling around town with the kids. Your Custom Printed T-Shirt is available on our premium 100% soft-style cotton, Personalized Women's T-Shirt, machine washable in adult sizes S-2XL. Shirt is 4.5 oz, pre-shrunk, double-needle stitched sleeve and bottom hemmed. Includes FREE Personalization. Personalize your T-shirt with any title & up to 30 names. I was very pleased with my purchase. It was just as I expected. I will be ordering again for sure. GiftsForYouNow offers many great Personalized Gifts for Mother’s Day that your Mother or Grandmother will cherish for years to come! 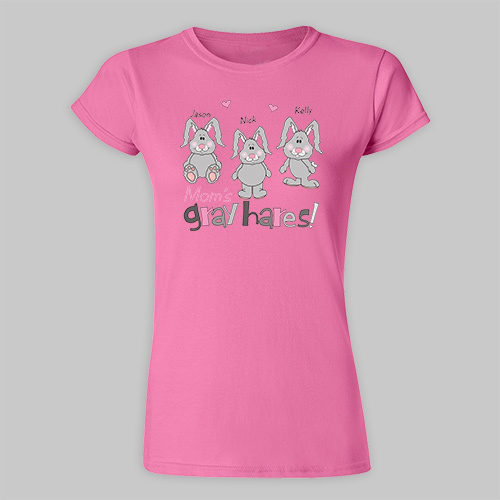 We also have a great selection of Personalized Grandma Gifts, Personalized Sister Gifts & Personalized Friendship Gifts. For all your Personalized Gift giving needs shop at GiftsForYouNow, today!